This Rakhi, look sizzling hot in these amazingly stylish summer outfits! The special occasion of Rakhi calls for some special dressing. Like all festive occasions, girls love to dress up and look their best on Raksha Bandhan. While fashionistas don’t really need a reason dress well, Rakhi offers just the right opportunity to do that! Wearing new clothes is one of the traditions of Rakhi and therefore, this is an excuse enough to go shopping! Summer outfits for Rakhi this year are breezy, colorful, fun, funky, classy and to cap it all, the ultimate comfort wear. But before you head for the nearest store, showroom or mall, we are happy to offer a little help so you stay on top of the fashion charts, as always. Clothing should be attractive and dressy yet not overtly decorative as Rakhi is a day function. 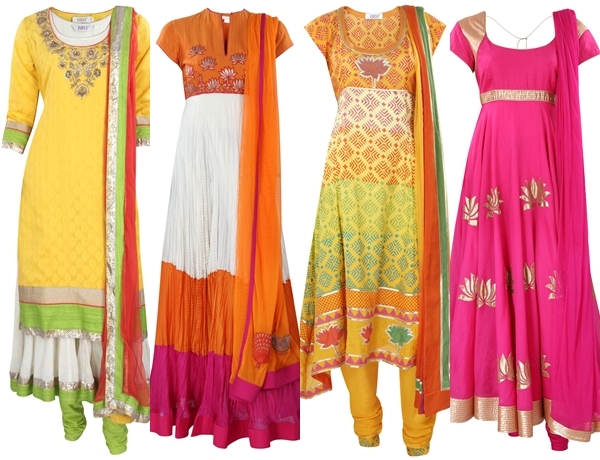 The colors should be auspicious – orange, coral, fuchsia, bright yellow – all happy colors. If you don’t want to go too bright, choose pastel or toned down versions of these colors that have embellishment in the form of gota patti, mukaish or sequin-work. The gota trimming adds to the bling factor and is yet not OTT. A French chiffon saree with gota border or satin saree with sequin work or even a handloom saree with gold zari is a great choice. Pair them with a brocade blouse if the function is more elaborate. Since we have just pledged support to weavers and craftspersons for National Handloom Day, this is even more symbolic. Long well-fitted kurtas in flowy fabrics with a tight churidar looks sassy and dressy. If you choose to opt for a solid colored salwar kameez, you can always brighten it up with a heavy dupatta! If you have to go to work after the festivities, wear a comfortable lightweight salwar-kameez or churidaar kameez. Chiffon with a slight tough of brocade – patches or borders – looks really nice. Colors should be bright with an element of gold to give that festive feel. For the avant garde women and those who like to be trendsetters, you could experiment with kaftans in bandhani or lehriya fabric paired with churidars or straight pants. Dogris are also really in and so are Pakistani kalidar salwars. Do also remember not to overdo it when you dress up for Rakhi. It would be wonderful to let the garment speak for itself. Go for understated elegance – you should wear the garment, don’t let the garment wear you! On the accessories front, if the look is busy the accessories should be very minimum and vice versa. As a general rule, always a good idea to wear either heavy earrings or heavy bangles – not both. If you want to wear bangles and earrings both, keep them fuss-free.